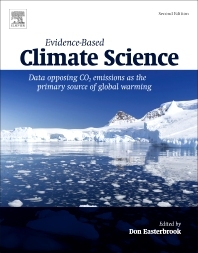 Evidence-Based Climate Science: Data Opposing CO2 Emissions as the Primary Source of Global Warming, Second Edition, includes updated data related to the causes of global climate change from experts in meteorology, geology, atmospheric physics, solar physics, geophysics, climatology, and computer modeling. This book objectively gathers and analyzes scientific data concerning patterns of past climate changes, influences of changes in ocean temperatures, the effect of solar variation on global climate, and the effect of CO2 on global climate. This analysis is then presented as counter-evidence to the theory that CO2 is the primary cause behind global warming. Increasingly, scientists are pointing to data which suggests that climate changes are a result of natural cycles, which have been occurring for thousands of years. Unfortunately, global warming has moved into the political realm without enough peer-reviewed research to fully validate and exclude other, more natural, causes of climate change. For example, there is an absence of any physical evidence that CO2 causes global warming, so the only argument for CO2 as the cause of warming rests entirely in computer modeling. Thus, the question becomes, how accurate are the computer models in predicting climate? What other variables could be missing from the models? In order to understand modern climate changes, we need to look at the past history of climate changes. Vast amounts of physical evidence of climate change over the past centuries and millennia have been gathered by scientists. Significant climate changes have clearly been going on for many thousands of years, long before the recent rise in atmospheric CO2 Evidence-Based Climate Science, Data Opposing CO2 Emissions as the Primary Source of Global Warming, Second Edition, documents past climate changes and presents physical evidence for possible causes. Chapter 3. Is the NASA Surface Temperature Record an Accurate Representation? 1. Are Today's Temperature Changes Unprecedented? 2. Was the Glacial-to-Interglacial Global Warming as Little as 3°C? 3. Was 2014 “The Warmest Year on Record”? and Does It Matter? 4. What Is the Ideal United Kingdom and Global Temperature? 7. Is Sea Ice Really Declining Rapidly? 9. Are the Computer Models of Climate Reliable? 10. Has Climate Science Become Dishonest? 11. Are Floods and Droughts Worsening and Crops Failing as Predicted? 2. Are Antarctic Glaciers Melting at an Accelerating Rate? 3. Is Antarctica Warming or Cooling? Chapter 10. Is CO2 Mitigation Cost Effective? 13. Where Are We Headed During the Coming Century? 4. Is Something Missing in the Climate Models? 6. Where Is Climate Headed During the Coming Century? Dr. Don Easterbrook has done extensive research into the of global climate changes, global warming and cooling, as well as the cause of abrupt global climate changes at the end of the last Ice Age. He studies the relationship of 25-30 year glacial and ocean warming and cooling cycles to solar variation and global warming and cooling. Additionally, he has analyzed the correlation of Quaternary inter-hemispheric climate changes, the of radiocarbon marine reservoir values, Holocene glaciation of the Cascade Range, and the Holocene climate changes, otherwise known as The Little Ice Age. He has analyzed the tephra and lahar chronology of Mt. Baker, and has extensively used shorelines to determine isostatic uplift rates in the Puget Lowland.